Notes: Based on the manga by Shibata Yokusaru, running in Young Animal magazine. Although this review was written prior to Derrick's, his supersedes this one as the "1st Opinion" on account of its being the first complete review we have. I'll admit that I tend to have a slight bias against most fighting shows. The genre in general isn't particularly appealing to me when it placed in a television series context. Now if you combine a typical fighting show with various forms of pointless fan service, I tend to be even more disinterested. Every once in a while though, I seem to run into one of these shows that I honestly enjoy simply for being a good fighting show. 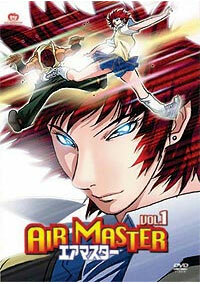 Air Master happens to be one of those. The plot, at least as revealed thus far, is not particularly deep. The main character, Maki, a former competitive gymnast seems to be seeking to recapture some of the same excitement she felt in her younger days and is using street fighting as the method. Though there are a few stories that take a few episodes to cover, there is no real continuing plot arc as of yet. For the most part we are introduced to a series of diverse fighters employing different styles and at some point they and the Air Master go at it. The animation and fight scene design are extremely well done in this show and its main strength. Though the characters obviously go a bit outside the realm of realism (the idea of BMXjutsu is amusing though), they are still much more grounded in basic physics than you see with a lot of similarly themed action shows and most importantly they actually fight. No one is flying around tossing out boring ki/energy/psychic blasts. Maki's style is a kick intensive martial art that uses elements of her own gymnastics background, and unlike, say, in the movie Gymkata, it actually comes off fairly well. None of the character designs in this show are particularly attractive. Even most of the female characters look rather manly and plain. It didn't particularly bother me, since in a show about brutal street fights it would make sense that it wouldn't be all the beautiful people fighting, but certain anime patterns might cause people to be a bit disappointed that there aren't more bishonen or that the females aren't a bit more conventionally beautiful. The overall tone and feeling of the show alternates between a lot of somewhat silly and somewhat puerile comedy and deadly serious fights. There are no clean fights in this show. Most of the fights tend to be very close and rather brutal. I was a bit surprised to even see them kick around a few poor "civilian" types in a few scenes. While this show isn't exactly a stunning example of deep characterization, there is a rich cast of side characters including Maki's high school friends. Maki herself is fairly likable and given a faint aura of naivete that provides an interesting contrast with her brutal and near sociopathic Air Master persona. Her past relationship with her family and her past as a gymnast plays a heavy role in her motivation, and that is slowly explored via flashbacks and some later encounters with her family members. The friends mostly seem to be there to provide the occasional bit of wackiness or plot hook. Besides the high school girls, most of the fighters who fight Maki seem to be woven back into the narrative as time passes including the somewhat amusing and somewhat psychotic "self-professed supermodel" Kaori Sakiyama who is obsessed with defeating the Air Master. Though she is, in a sense, simply fulfilling the fighting show's required archetype of "bitter obsessed slightly weaker rival" the strong-willed Kaori is actually a fairly intriguing character that I am growing to slowly like. There is one additional character that could potentially drastically affect how much people enjoy this show, Maki's friend Renge. This pint-sized high school student comes off basically as a loud-mouthed brat. Obviously meant for comedy, she gets a lot of screen time, but her antics and voice are likely to annoy a large number of people. She does add a touch of cuteness later on in the show via her adoption of a pet, but I suppose people really aren't watching a show like this for cuteness anyway. Recommended Audience: While no one has died (well yet at least), the fights tend to be rather brutal. Additionally, there is a pretty wide demographic involved in the fighting that some people might find upsetting. Many of the fighters are women or younger characters, and on a few occasions random innocent citizens are assaulted. Sexual content is fairly minimal, but there is an strong lesbian attraction plot element and the show in general does spend an inordinate amount of time drawing attention to the, ahem, attributes of one Maki's overly endowed friends. Overall, appropriate for teens and above.